Received: November 6, 2018; Revised: November 15, 2018; Accepted: November 21, 2018; Published online: December 31, 2018. Cemental tears are uncommon form of root fracture that can lead to rapid localized periodontal attachment loss. Studies have described periodontal breakdown as being associated with the separation of the cementum from the underlying tooth structure. The aim of this case report is to assess the outcome of treatment of cemental tear with several surgical treatment regimens. Three patients with cemental tear were treated with different surgical method. In all three cases, the cemental tear occurred on maxillary right central incisors. In each case, the root fragment were removed, the localized defect was treated using different surgical methods including guided tissue regeneration and bone graft followed by scaling and root planting. In all three cases, symptoms subsided after the treatment and clinical attachment level was improved up to 2 mm at 3 month after surgery. Both conventional and regenerative periodontal surgery could achieve successful outcomes. Cemental tear is an atypical form of root fracture which is defined as a complete separation of cemental fragment along the cementodentinal junction or a partial split in the cementum along an incremental line [1,2]. Cemental tears are categorized as localized tooth-related factors, and may be an influential factor that modifies or predispose to plaque-induced gingival disease and/or periodontitis [1,3,4]. Other such factors include enamel pearls , cervical enamel projections [6,7], developmental proximal or palatal grooves [8-10], root fractures . Periodontal involvement in relation to cemental tears typically presents as asymptomatic periodontal pocketing of sudden onset and rapid progression, followed by localized attachment loss [12-14]. Radiologically, it may be supported by a partial or complete separation of the cemental fragment and concomitant alveolar bone loss [2,4]. Although there are not so many studies reported so far, several studies say that various periodontal treatment modalities can treat cemental tears and the resulting defects [15-18]. The objective of the present case report was to evaluate the short-term clinical outcome of treatment of cemental tear with several surgical treatment regimens including guided tissue regeneration (GTR) and bone graft followed by scaling and root planing. A 52-year-old female patient visited in the chief complaint of gingival swelling and pain of maxillary right central incisor tooth (#11), and had no specific medical history. Clinically, wear facet on maxillary right (#11) and left (#21) central incisor labial aspects were found and there was palatal marginal gingival swelling and redness (Fig. 1A, Fig. 1B). We could detect cemental tear on the mesial root surface of #11 and found related clinical symptoms of rapid periodontal tissue breakdown (Fig. 1C). To eliminate the occlusal trauma, we performed occlusal adjustment on lingual aspect of #11. After the mucoperiosteal flap was elevated, the cemental fragment was removed along with degranulation and root debridement on the defect (Fig. 2A-C). Flap was repositioned and interrupted suture was done (Fig. 2D) and stitch-out was done after 1 week. At 3 months follow-up appointment postoperatively, favorable healing state was seen in the treated site both clinically and radiographically (Fig. 2E, Fig. 2F). Initial intraoral photograph & radiograph of case 1 patient. (A) Labial gingival swelling and redness of of the maxillary right central incisor were found at first visit. (B) There was palatal marginal gingival swelling and redness was also detected around of the maxillary right & left central incisors. (C) Cemental tear is shown on the radiograph (red arrow). Surgical procedure and postoperative radiograph of case 1 patient. (A) Flap elevation. (B) Degranulation & root debridement. (C) Removed ce­mental fragment. (D) Everting Suture. (E) Postoperative 3 months photograph. (F) Postoperative 3 months radiograph. A 63-year-old female patient visited in the chief complaint of fistula formation of #11 buccal gingiva. Clinically, gingival swelling with sinus tract on #11 distolabial attached gingiva was found, and there was anterior deep bite tendency (Fig. 3A). We detected the cemental tear on the distal side of the #11 in the periapical radiograph (Fig. 3B). To eliminate the occlusal trauma, we performed occlusal adjustment on lingual aspect of #11 and confirmed the loss of fremitus. Surgical removal of the cemental fragment along with flap operation was planned. After flap elevation including vertical incision, cemental fragment was removed from the #11 distal defect. The localized defect was treated by OFD along with degranulation, and root planning (Fig. 4A-C). Initial intraoral photograph & radiograph of case 2 patient. (A) Sinus tract was formed at distolabial side of the maxillary right central incisor and anterior deep bite was shown also in photograph. (B) Cemental tear is shown on the distal root surface of the maxillary right central incisor. Photographs and radiograph of surgical procedure and postoperative healing of case 2 patient. (A) The sinus tract is still present on the day of surgery at the distolabial area of the maxillary right central incisor. (B) The root surface area where is cementum torned is designated by black arrows. (C) Degranulation and root planing was done. (D) Resorbable membrane adaptation. (E) Suture was completed. (F) Stitch-out was done. (G) Postoperative 3 months photograph. (H) Postoperative 3 months radiograph. Initial intraoral photograph & radiograph of case 3 patient. (A) Fistula can be seen at the mesiolabial area of the maxillary right central incisor due to cemental tear (red arrow). (B) Cemental tear is designated by red arrow on the radiograph. Photographs of surgical procedure and postoperative healing of case 3 patient. (A) Flap was elevated. (B) Removed cemental fragment. (C) Degranulation & root planing was done. (D) The defect was filled with Xenograft & covered with resorbable membrane. (E) Suture was done. (F) Stitch-out. The sinus tract was disappeared. The overall result was summarized in Table 1. In all cases, clinical symptoms subsided after the treatment and periodontal pocket depth was reduced with the increased recession. Clinical attachment level was gained up to 2 mm with a mean of 0.70 mm gain. Clinical symptoms subsided after the treatment and periodontal pocket depth was reduced up to 3 mm with increased recession. Clinical attachment level was gained up to 2 mm with a mean of 0.70 mm gain. The etiology of cemental tear has not been elucidated yet. Occlusal trauma and/or overloading is the most commonly reported cause and considered the most plausible ones, followed by wear of facet, parafunction habit, and age of patient [4,19]. It is supported by the fact that the patient age is more than middle age in previous studies including this study. Moreover, as in Case 2, if the trauma caused by abnormal occlusion is continuously applied to the teeth, the possibility of cemental tear is likely to increase. As the previous case reports say that cemental tears primarily affect single-rooted teeth, particularly incisors and premolars [2,17], all the cemental tears occurred on upper central incisors in this study. The treatment of periodontal involvements associated with cemental tear has a wide range from non-surgical periodontal therapies to combined regeneration procedures, to final extraction if poor prognosis [12,13,16,18]. On the other hand, when a cemental tear is solely a radiographic finding without any accompanying symptoms or signs, invasive intervention may not be necessary and can be maintained with conservative follow-up . Scaling and root planing alone, or in conjunction with soft tissue curettage, OFD [1,2], GTR  and osseous grafting alone , and combined regenerative procedures [17,18] were suggested for treatment of defects associated with cemental tear in previous reports. We should focus on the fact that the studies reporting successful treatment results included a common procedure to remove the separated root fragments in the treatment plan [15,16]. 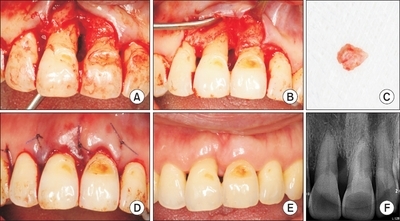 Within follow-up periods from 3 months, as in this case, to 7 years, through the surgical treatment plans described above, including the removal of cemental tear and the treatment of related periodontal defects, could provide satisfactory results and favorable prognosis for both patients and clinicians [2,4]. Fundamentally, when the torn cementum is exposed in the periodontal pocket，it should be removed to prevent accumulation of dental plaque [1,2,11]. We could get the successful outcomes by both conventional and regenerative periodontal surgery in this study. At 3 months follow-up appointment postoperatively, favorable healing state was seen in the treated site both clinically and radiographically. However, the follow-up report of the clinical results including the present study, after treatment of cemental tear is limited to the short period [12,13]. Therefore it can be a limit to the absence of long-term results. In addition, the size of the cemental fragment isolated from the root was not consistently considered in the previous studies [15,17], while the relative size of the lost structure compared to the total root surface area has not been addressed in the literature [14,20,21]. In order to overcome these limitations, it is necessary to standardize the shape and size of cemental tears and the size of the separated cemental fragment, and long-term follow-up and longitudinal studies should be performed in a large number of cases. An early differential diagnosis between cemental tear and true periapical/periodontal lesion and initiation of proper treatment of cemental tear seems to be key factors for saving the involved tooth. Marquam BJ. Atypical localized deep pocket due to a cemental tear: case report. J Contemp Dent Pract 2003;4:52-64. Müller HP. Cemental tear treated with guided tissue regeneration: a case report 3 years after initial treatment. Quintessence Int 1999;30:111-115.